The Dark Knight isn't the only one returning. Maniacal enemy of Batman who goes on a brutal crime spree to draw out his nemesis. In Frank Miller's last worthwhile contribution to the Batman mythos, Joker has been absent from Gotham just as long as Bruce has been - but rather than retirement, he's been in an unresponsive fugue state in Arkham Asylum Home for the Emotionally Troubled. When the news begins reporting on Batman's reappearance, Joker wakes up - he finally has something to live for again. We've told you about two things Miller did that have since become constant parts of the story, so here's another: before DKR, Joker was never obsessed with Batman - not the way he is now. He'd commit his crimes, he'd get annoyed when Batman got in his way, but that was it; it was Miller who made Joker's life all about Batman. He also made the Joker exceedingly femme, because this was the '80s and that was enough to make a villain threatening. He called Batman "darling," he casually talked about his lipstick, he looked like Tim Curry, and had the mannerisms of David Bowie... it was a period when being anything less than a super macho man was transgressive, so that's what Joker was. 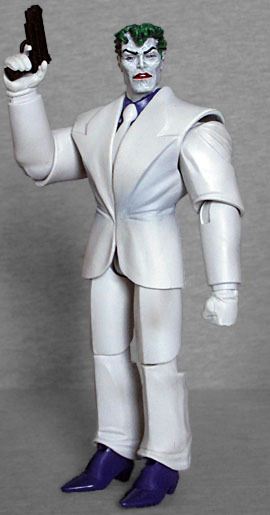 This figure is based on his big running battle with Batman, not his appearance on the David Endocrine Show, though a repaint would be super simple. In both versions, the cut of his suit is the same: exaggeratedly broad shoulders, a narrow waist, straight pants and high-heeled shoes (meaning you can add a dash of Grace Jones to the inspiration stew, as well); the difference between the two came in the colors. For TV, Joker wore a gray herringbone jacket and black pants; for his crime spree, it was all white. The shade of purple used for his shirt and shoes matches what's seen in the scene, and the clothes are sculpted with just a few key wrinkles at the waist, shoulders, and pant cuffs. His lapels are as wide as his chest. The jacket is a PVC piece over the chest beneath, but where it's glued shut inside gets in the way of his necktie, slightly, tending to push it off toward one side. The suit is white, but it's not pure white. It would never be invited to speak at CPAC. It's been painted with a few subtle shadows to capture the detail, and that part of the paint is ver nicely applied - it's not big blue smudges, it's actual subtle shading. Mattel must have picked the right factory for this one! 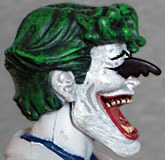 However, the paint on Joker's face is not nearly as good, with his jawline and cheeks left entirely gray. Was this an attempt at shading? Or just something that got missed? Since solid white makeup hides a multitude of sins, this is incomplete, almost drybrushed - it gives Joker the appearance of age. His hair, eyebrows and lipstick are applied cleanly, and his pale eyes are squinty. There should be purple apps on his wrists, to signify his shirt cuffs, but those got missed. A shame, because they would have broken up the white between his jacket and his gloves. The articulation is nothing special. 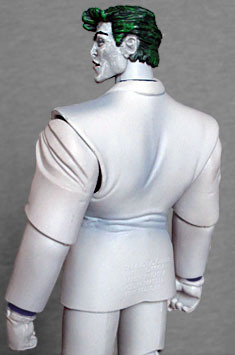 Joker gets a balljointed neck, peg/hinge shoulders and elbows, peg wrists, torso hinge, swivel/hinge hips and knees, and hinged ankles. In the comic he constantly holds himself up tall, not hunched over like all the other characters, but it's sad that you can't have him adequately splayed against a wall, as in his final scenes in the book. And hey, speaking of which, let's look at the accessories. He has a gun, and a knife (one he used to threaten civilians, the other he only used on Batman), but the best item is the alternate head. Rather than the calm, sinister, and demeaning look on the normal head, this one has its mouth open wide in a grotesque laugh. It's packaged sideways in the tray, with good reason: this head represents Joker at the end, the very end, after he's broken his own neck to frame Batman for murder. You'll recall before that happens, he's already taken a batarang to the eye. Well, that might be a bit too graphic for a toy that can (theoretically) be found in the aisles at Toys Я Us and Walmart, but Mattel didn't want to leave us hanging. So the demi-batarang is packaged separately, and the head is turned to the side so the slot where the weapon plugs in is away from innocent eyes. Not a bad twist on the old "hidden accessories" schtick that McFarlane Toys used to have to pull sometimes back in the old days. 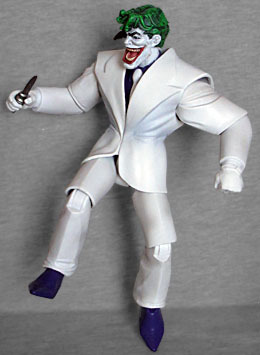 Joker is part of a proper series of toys, so he comes with a Build-A-Figure piece. 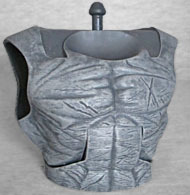 The figure in question is King Shark, and the piece is the chest. Mattel, surprisingly, has managed to build a nice little collection of Dark Knight Returns figures. This is the seventh one they've made (eighth, if you count the blue Batman repaint), which is more than any other company. 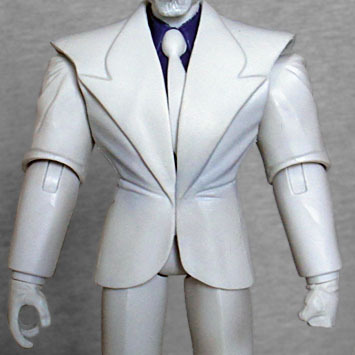 DC Direct made a Joker ages ago, but while it came with one of the child-shaped robot bombs, it was barely articulated at all, and had no alternate head. Go Mattel!